10 Seconds To Download - A new Era For Golf! The 3D Flyover can be adapted for easy download to mobile and cell phones with an Internet browser or video feature. 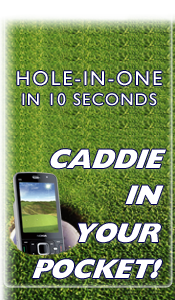 A few clicks can load your course on to golfers mobile or cell phones - it doesn't get any better than that! The course Flyover can help familiarise golfers before they visit and help them when they arrive. You can charge for downloading from the Internet or charge for a 10 second load at the Pro's Shop. This most personal of mediums, adds enormous value for the golf course and provides real impact to attract sponsors for this unique presentation of your golf course. Distance markers can be placed on to your Flyover model to help golfers identify the age old question - "How far is it to the green?"